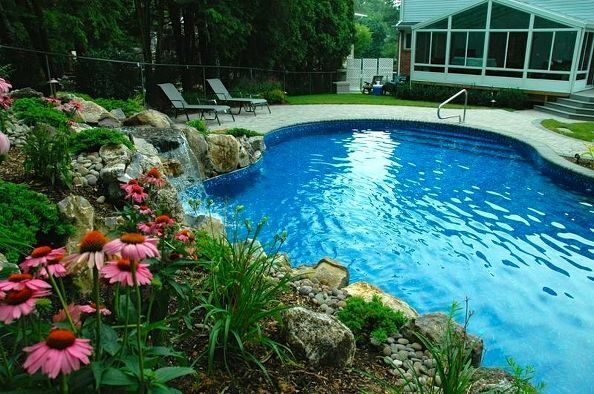 Can I Fit a Full-Sized Pool on My Small Property? 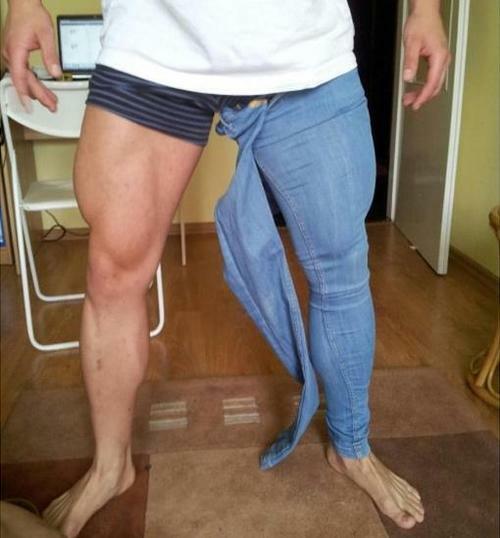 Most of us have experienced something that just won’t fit. Be it an old pair of favorite jeans, or that comfy sofa that won’t squeeze into a new apartment. And outside? 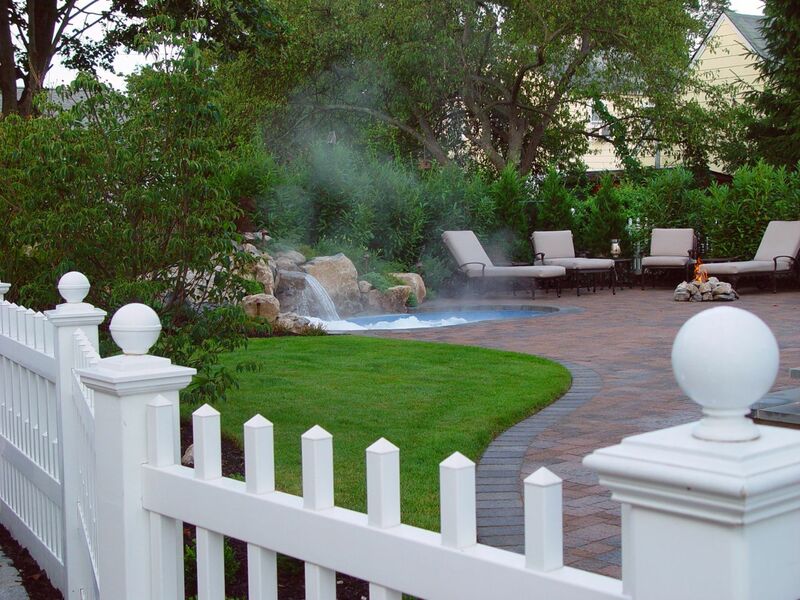 Well, if your home is in Nassau County, Long Island, NY, there’s a good chance you live in a tightly packed community where there’s not much room for a lot of outdoor living amenities. 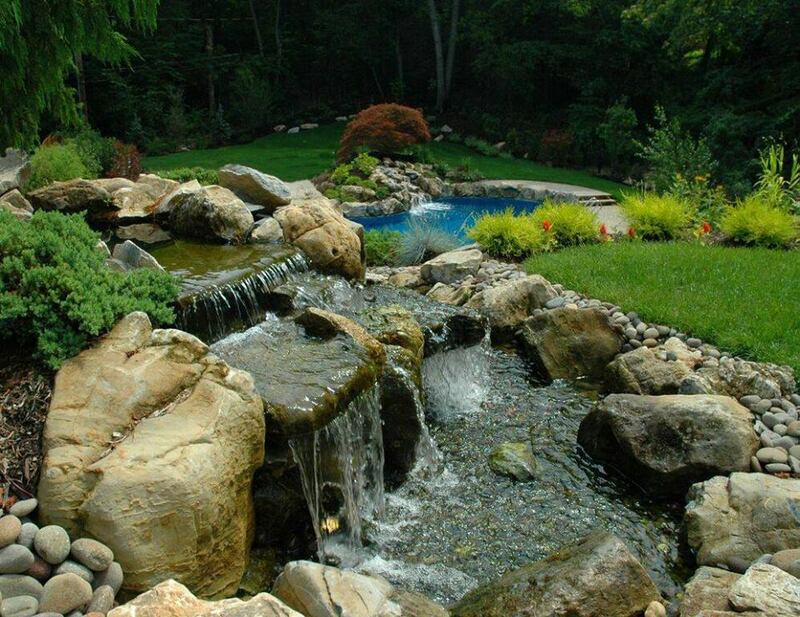 The same is true for many parts of NY’s Suffolk County. 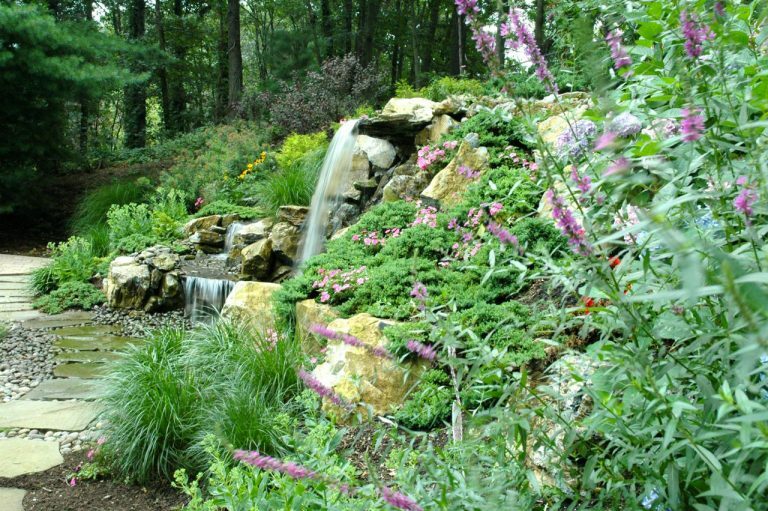 In addition, these New York communities can be bedeviled with strict town setback codes. So if you’re hankering for a full-sized swimming pool in parts of our neck of the woods, well, it might seem easier for a body builder to fit a pair of old comfy jeans over his massive new muscles. 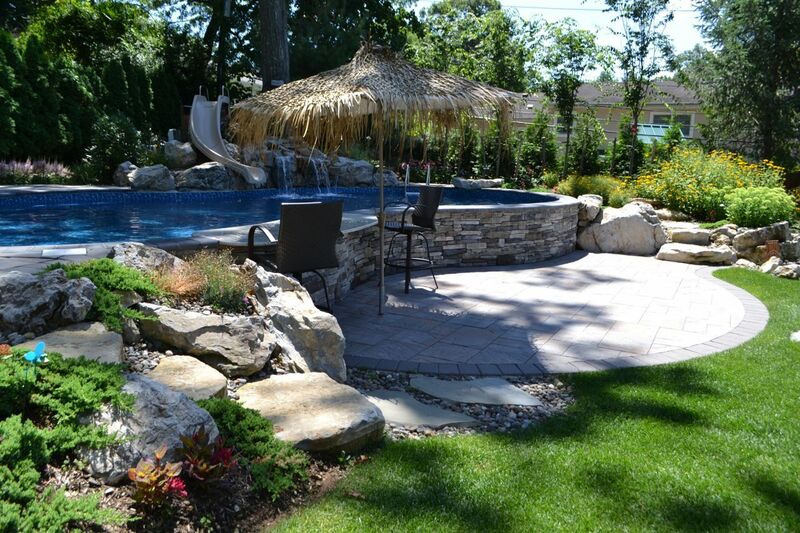 The backyard for this Long Island family wasn’t large. 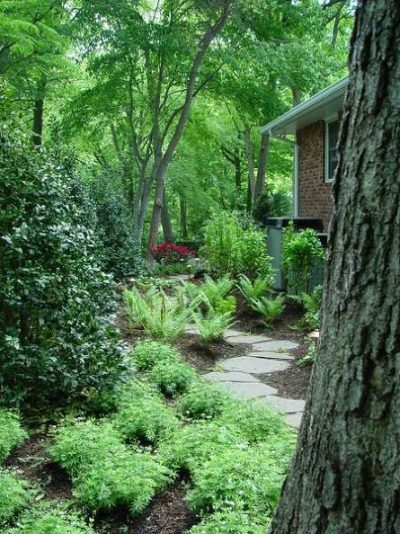 It sloped toward the house, and there was a bundle of challenging Town setback regulations. 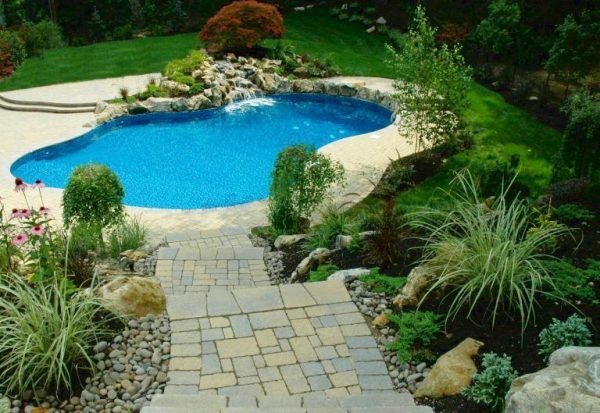 They felt a pool was out of the question. 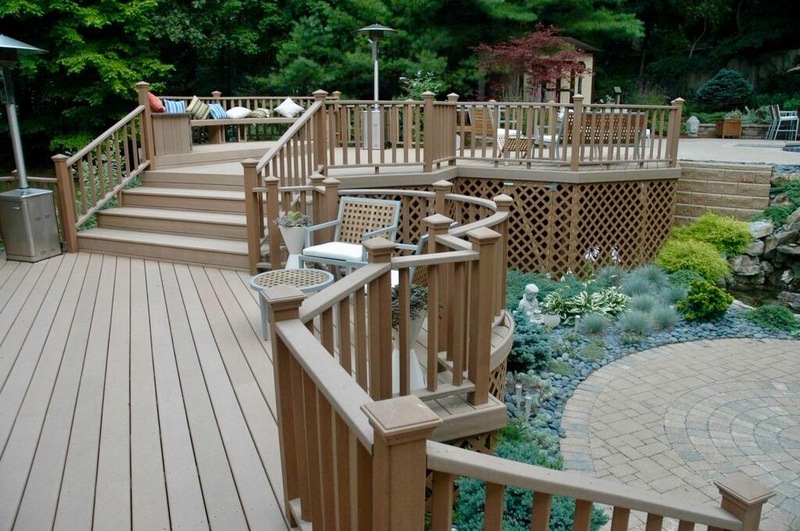 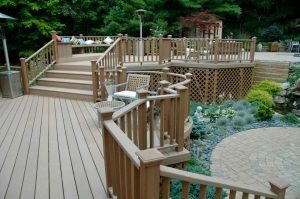 However, the owners contacted Deck and Patio — initially just to change out their old deck for a new Trex Composite one. 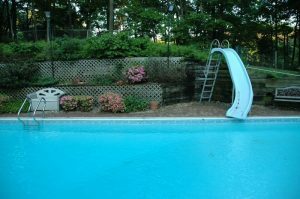 But after sharing their dreams for a pool with members of our team, they were thrilled to learn that it was more than possible. All that was needed was some creative ideas. 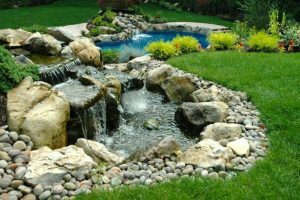 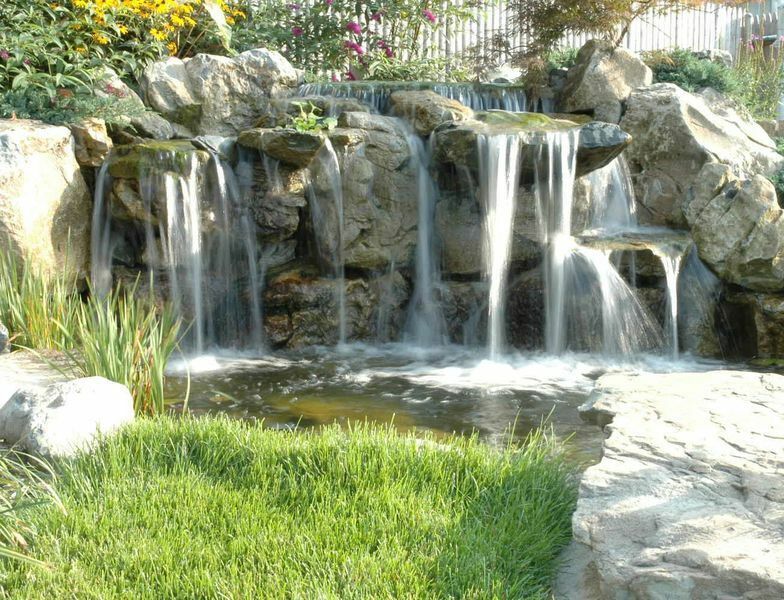 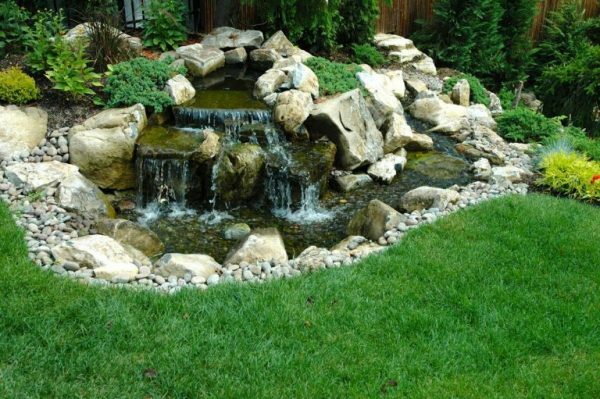 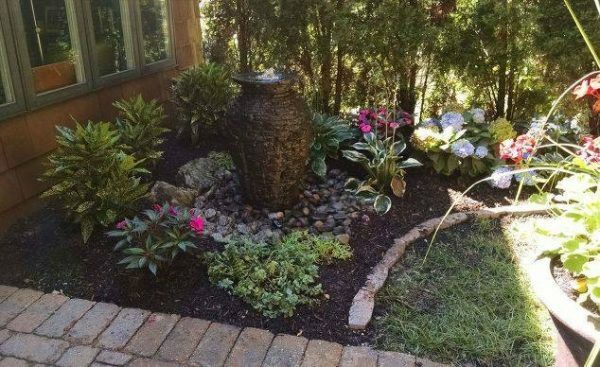 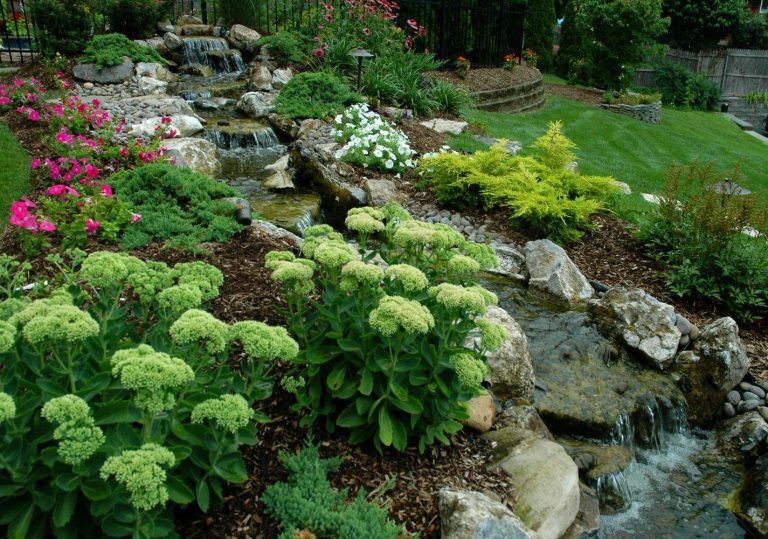 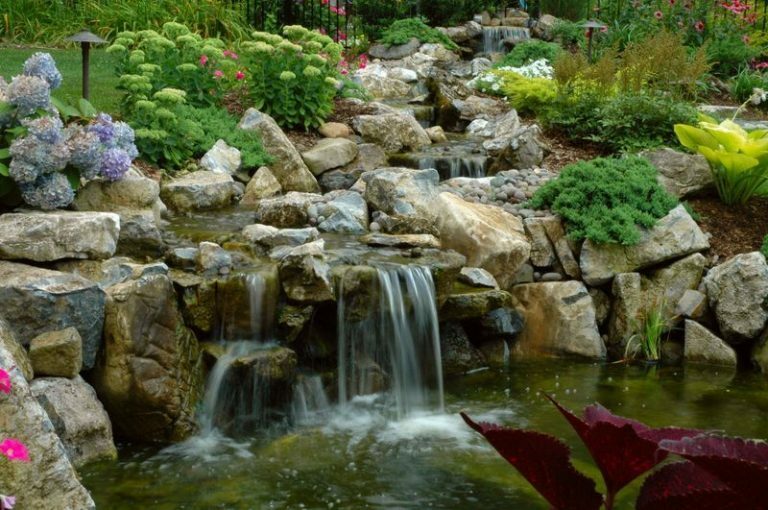 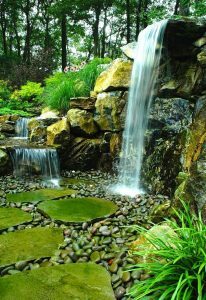 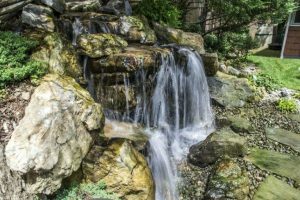 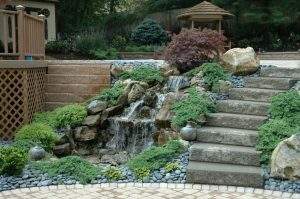 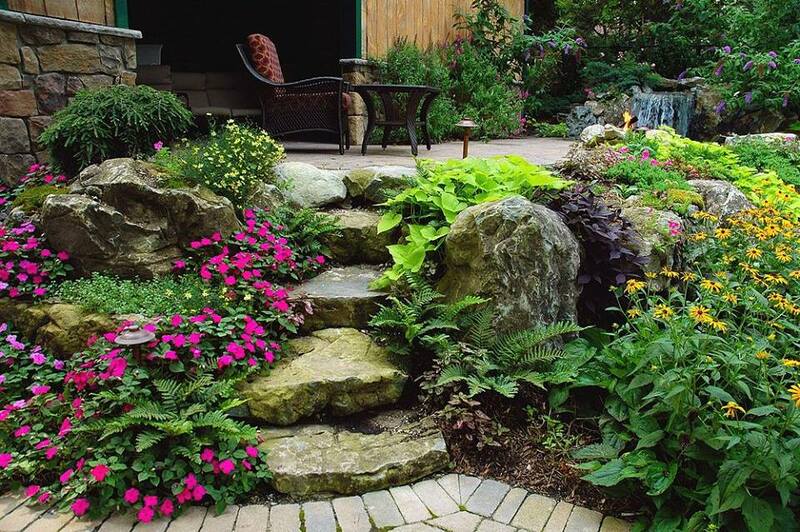 Another key element that Deck and Patio suggested was to take advantage of the property’s higher grade by abutting the pool against a new natural retaining wall of moss rock, plantings — along with a stream and waterfall that would splash into the new pool. 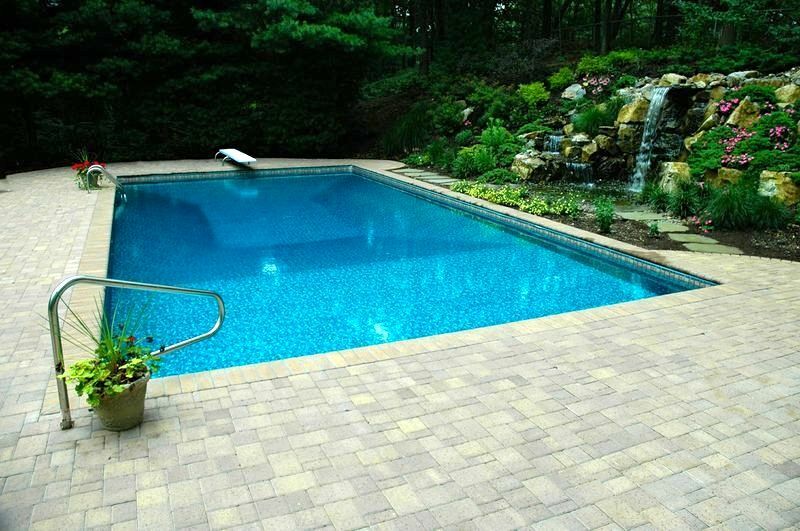 The final touch to the plan was a handsome Cambridge patio/pool surround. 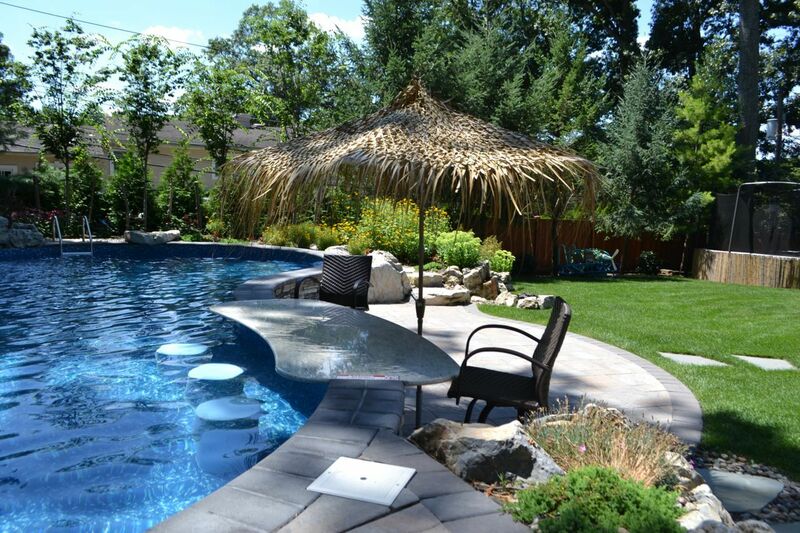 The vinyl-lined pool allowed us great flexibility in the shape of the pool. It was designed to follow the curves of available property space. 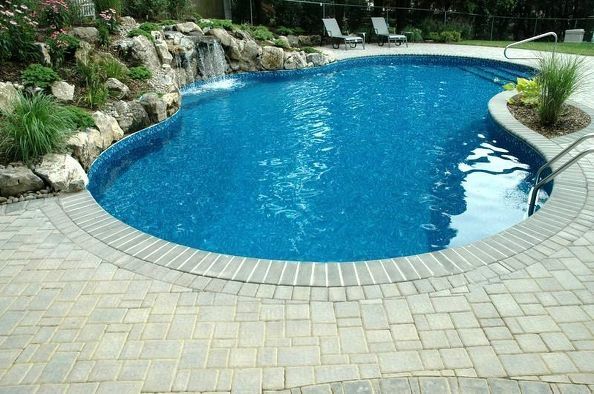 Note that the pool steps are also vinyl-lined so no scrapes or roughness on the feet when stepping in or out. 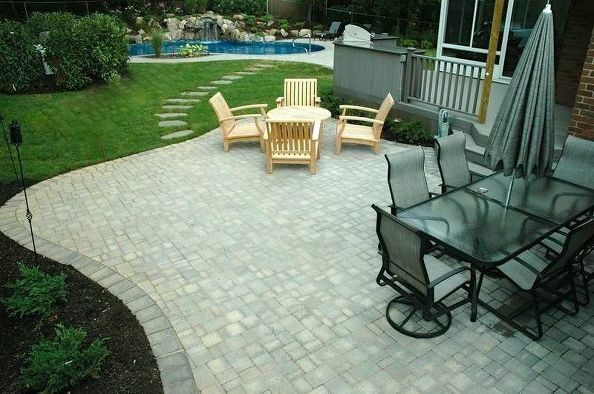 Note how the Cambridge pavers (from Cambridge’s Round Table pavingstones) were set down in a herringbone pattern. 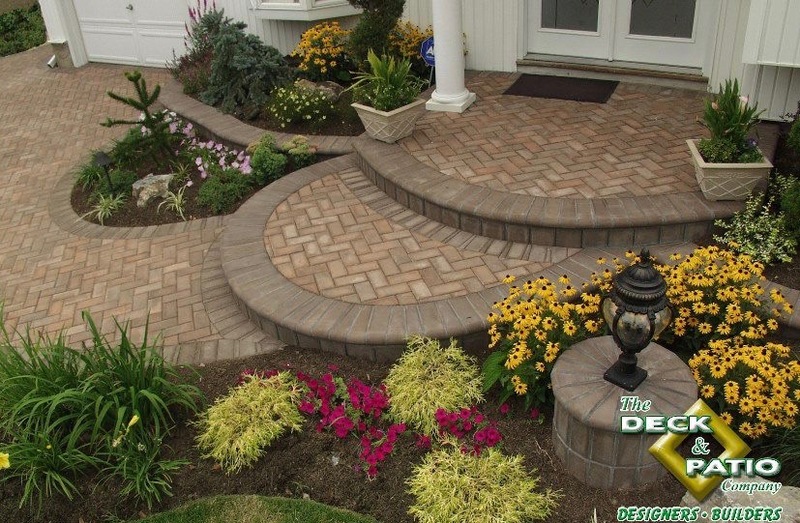 The pavers’ have embossed dimpled surfaces that roll into soft beveled edges on four sides. 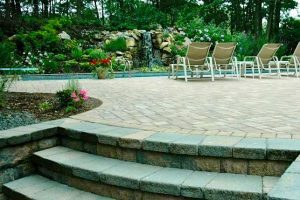 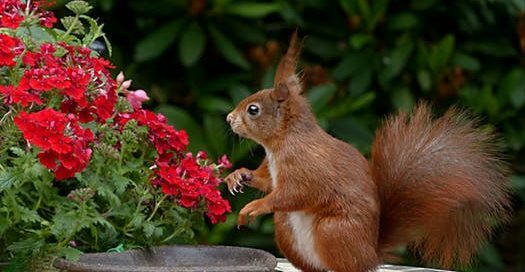 The homeowners asked for a second patio nearer the house. 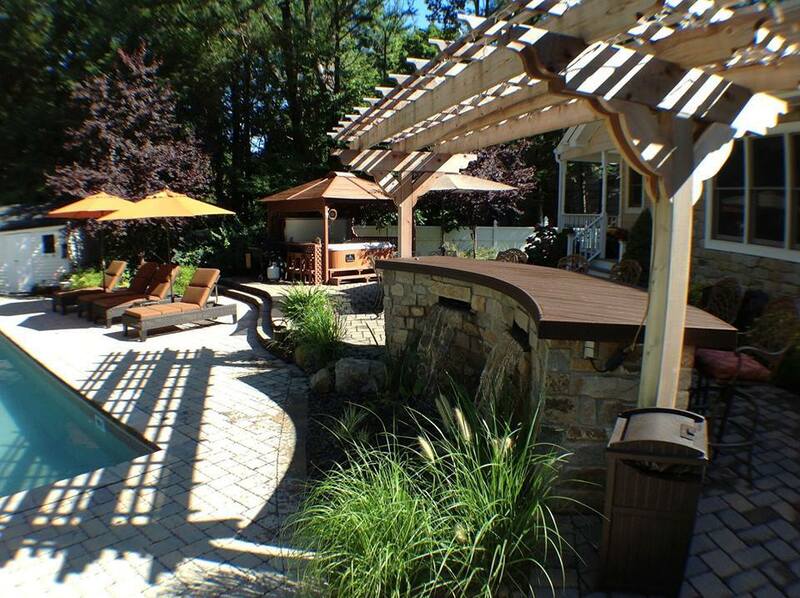 It’s an ideal spot that is also where they have an outdoor kitchen complete with refrigerator and BBQ. 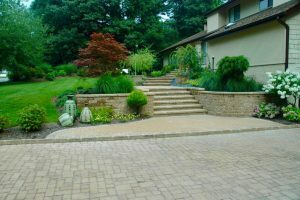 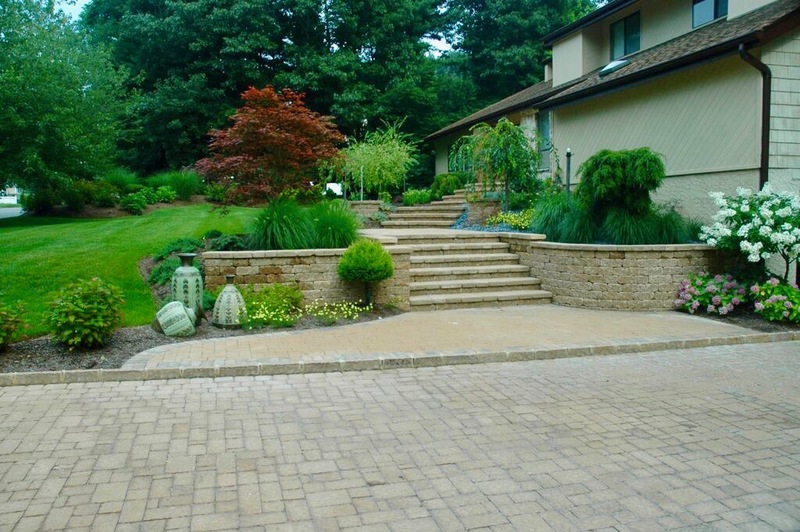 Bluestone stepping stones and lush Deck and Patio landscaping completed the project. By June Sullivan|2018-02-15T14:30:03-05:00February 15th, 2018|Backyard Escapes, Backyard Refurbishments, Backyard Upgrades, Composite Decking, Creative Design, Deck and Patios, Design and Build Experts, Landscaping, Moss Rock and Stones, Outdoor Kitchens, Outdoor Living, Patios & Decks, paving stones, Ponds & Water Features, Pool Surrounds, Pool Waterfalls, Pools & Spas, Retaining Walls, Trex Decking, Updating Landscape, Vinyl-lined Pools|Comments Off on Can I Fit a Full-Sized Pool on My Small Property? 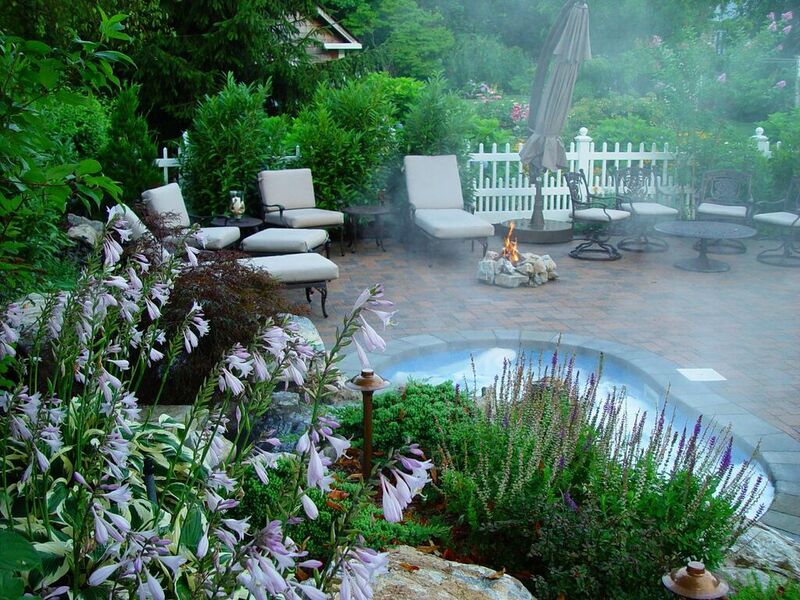 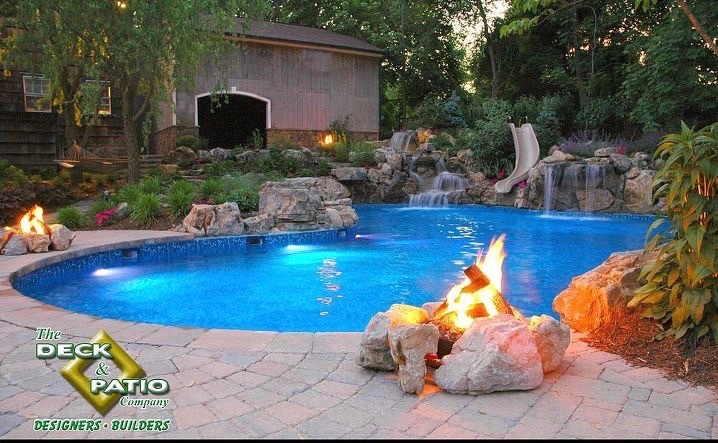 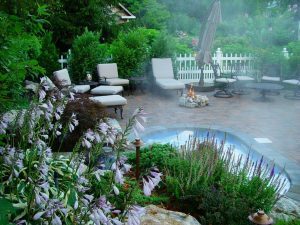 Deck and Patio and True Blue Swimming Pools Create Natural-Looking Oasis that Wows! 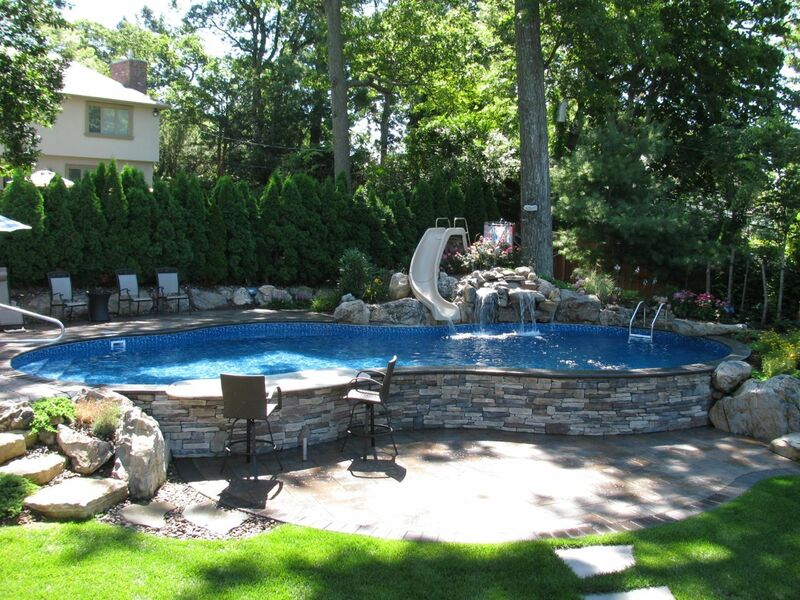 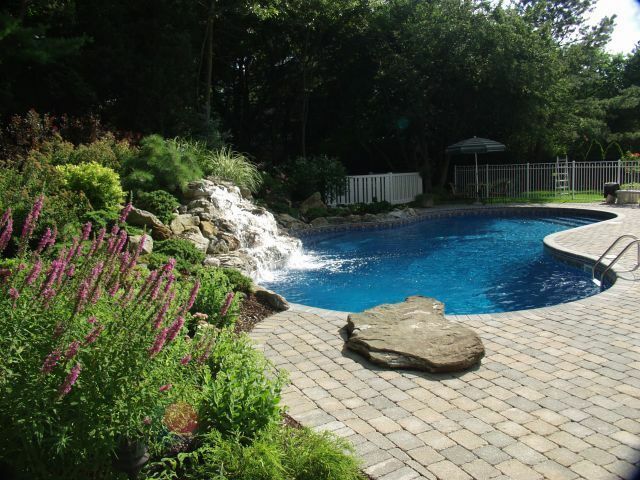 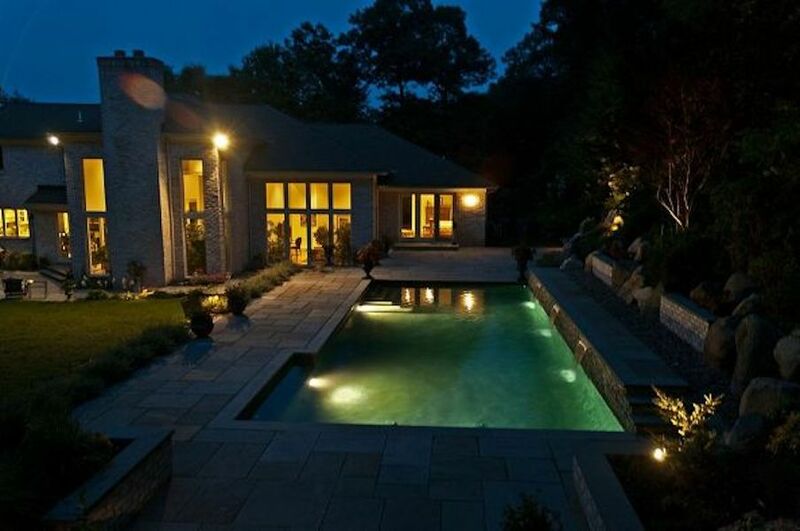 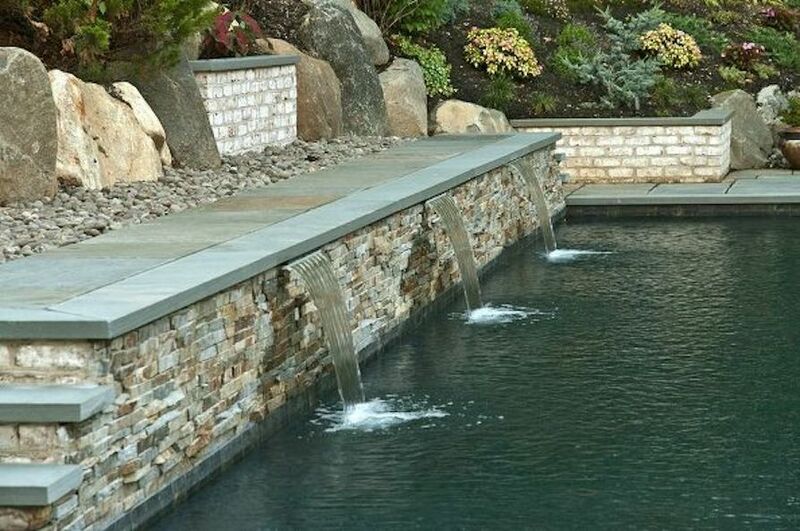 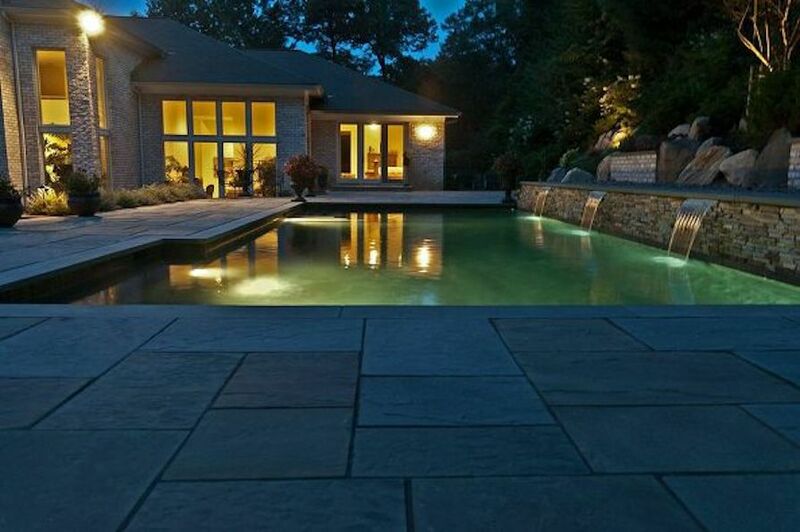 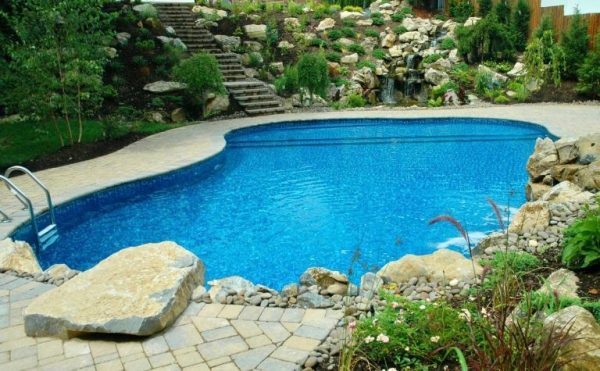 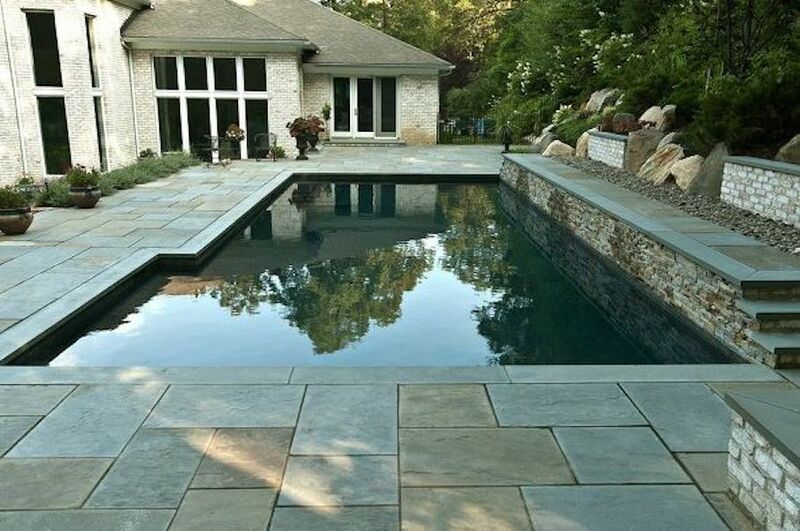 When the owners of this Long Island, NY, small sloped property first contacted the president of True Blue Swimming Pools, Michael Truehart, they expected that, since most of their small backyard had a sloping terrain, the pool company would design/build a pool on the only small patch of flat land available. 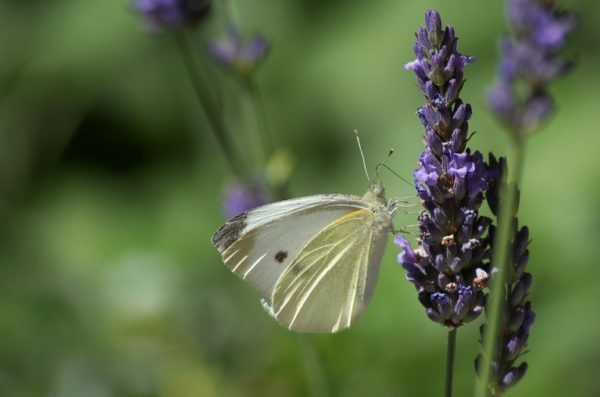 “But Michael felt it was a pity to use up that flat piece of lawn, where their children loved to play,” says Deck and Patio owner Dave Stockwell. In addition, the clients had revealed they hoped for more than a pool. 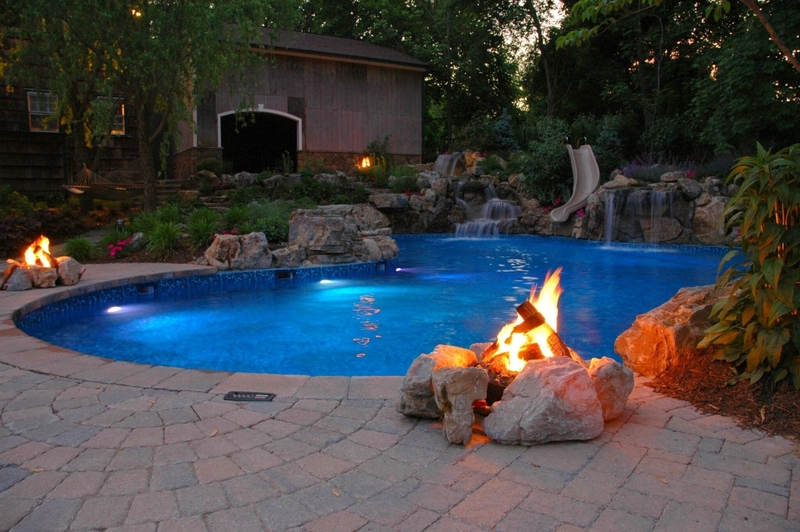 There were several other outdoor living amenities they wanted. 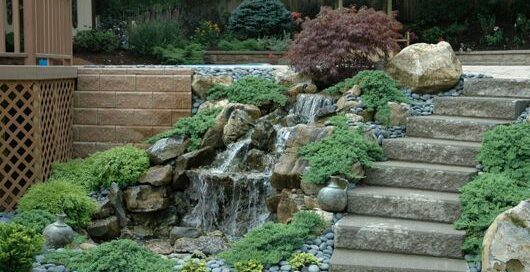 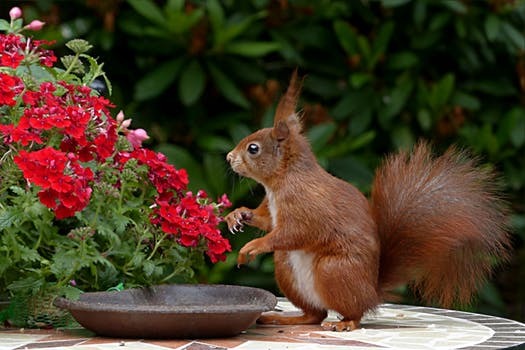 Michael explained they were all possible, but it would require a lot of creative landscaping. 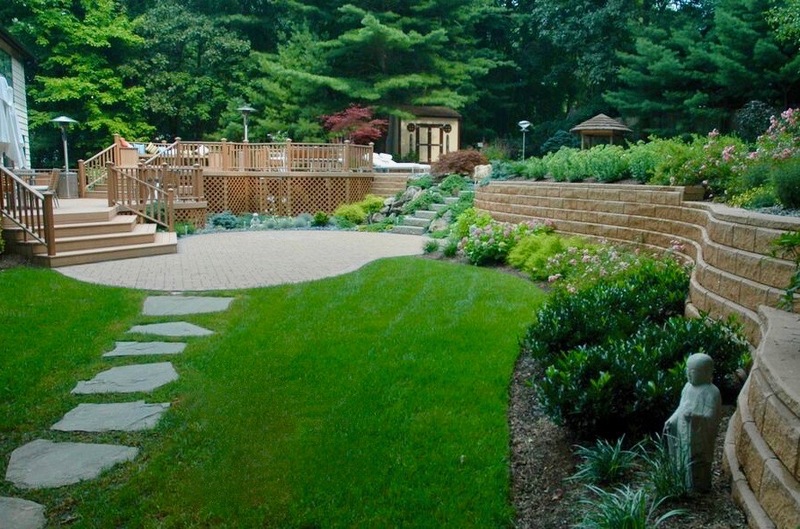 A quality design/build landscaping firm could sculpt the seemingly unusable elevated terrain. 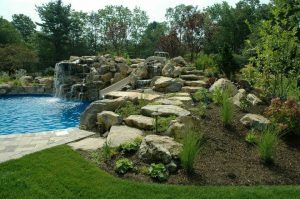 Despite the small and challenging terrain, this backyard upgrade included a pool and a Wild Ride slide, granite swim-up bar with 3 vinyl-covered in-pool stools, pool waterfalls (that help form part of a natural-looking retaining wall), diving rock, Tiki (Hula) patio umbrellas, outdoor shower, and lush plantings. 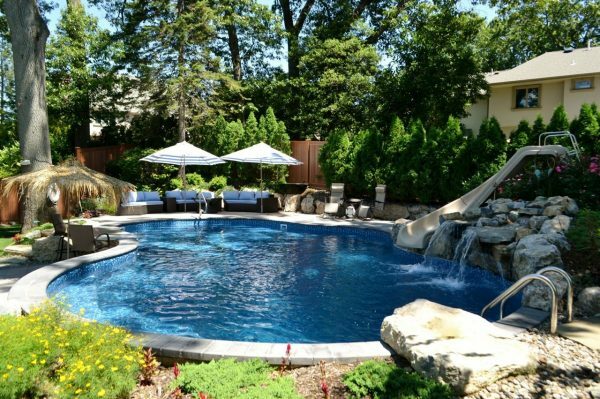 Along with designing a freeform shape, True Blue Swimming Pools chose a Loop-Loc “Sea Blue”vinyl liner to give the pool an enticing South Seas’ lagoon appeal. 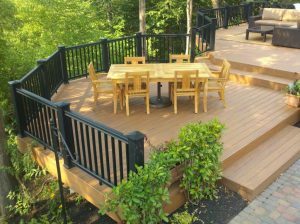 Deck and Patio’s fullnose coping also offers a harmonizing curved form. This pool was designed one one side with an exposed wall in order to address the problems of the sloping terrain. 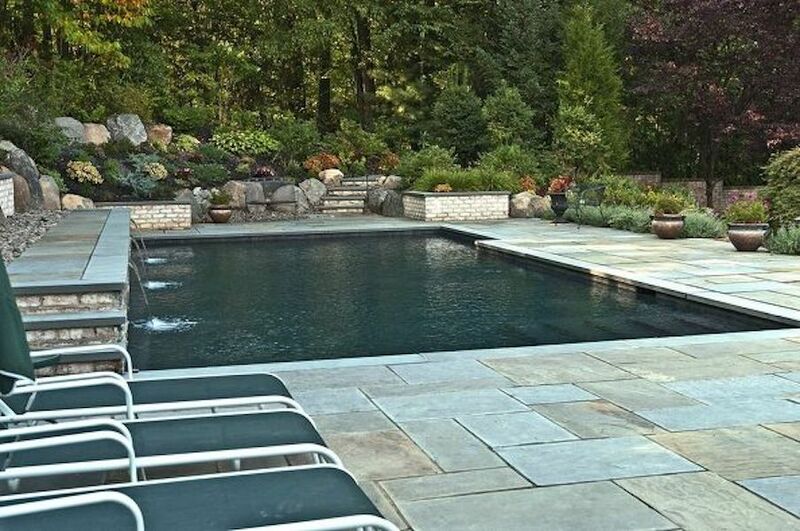 Deck and Patio veneered the wall in Cambridge Ledgestone. 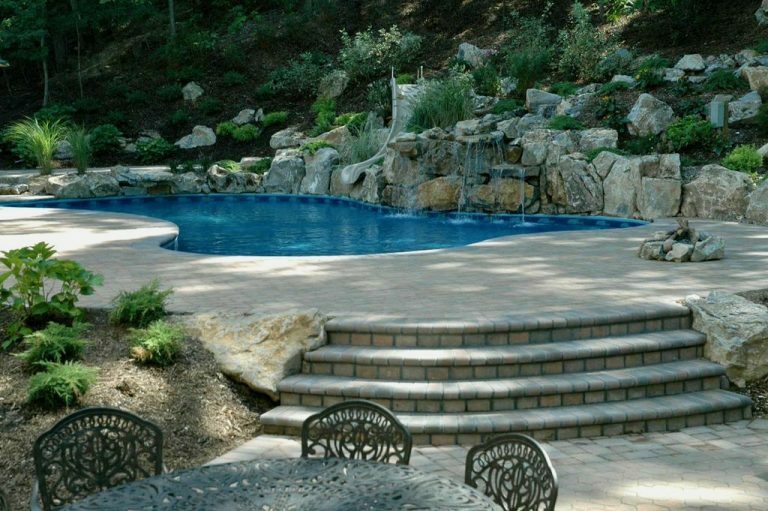 One way the teams added drama to the lower patio area was to veneer the pool’s exposed side in Cambridge Ledgestone. 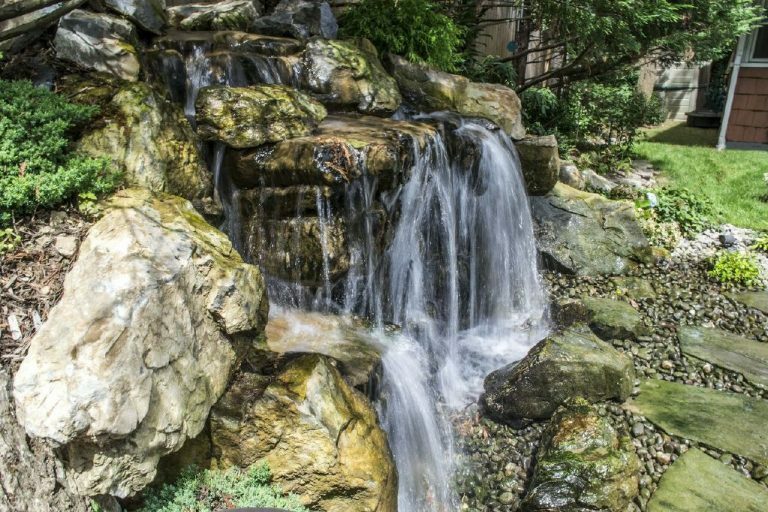 It’s the backyard’s main lounging area and the perfect spot to relax while listening to the gentle sounds of the waterfalls running over moss rock. An impressive granite swim-up bar with 3 vinyl-covered in-pool stools, all shaded by Tiki patio umbrellas are just some of the wonderful amenities contributing to the “wow” factor these clients were looking for. 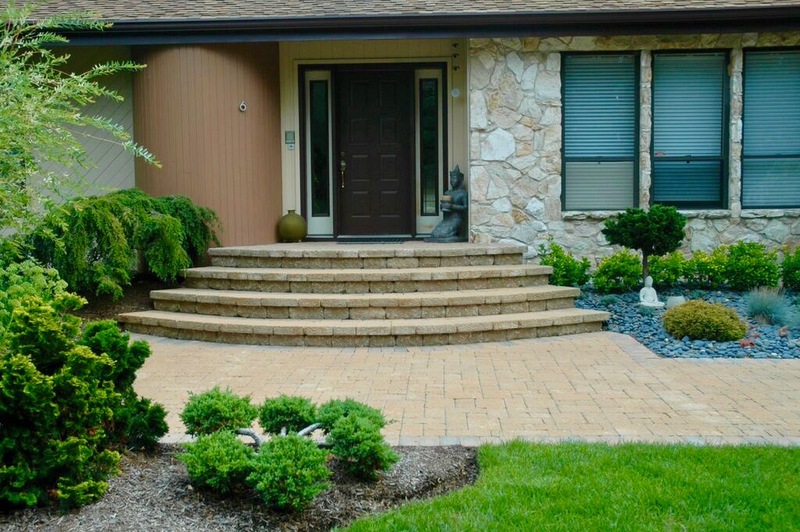 Also note the charming stone step area leading to the diving rock — still leaving intact the lawn space where the children to play.